Chapter markers were traditionally the domain of DVDs. However, both QuickTime movies and MPEG-4 movies for the web can also contain chapter markers, which makes navigating through a long movie a lot faster when you are trying to find a specific section to review. Starting last year, we included chapter markers in many of our training titles because viewers told me they watch our training multiple times to be sure they understand a subject. So, we added chapter markers to help them navigate between sections. Which is a great idea… provided, that is, that you know how to find them. And that’s what this article is about. First, open your movie in QuickTime. All available chapters in that movie are displayed, along with the name of that chapter. Click a thumbnail image which represents the chapter where you want to jump. In QuickTime 7, look in the lower right corner of the player window. If you see text, click to reveal a pop-up menu. The checkmark shows your current location. Click the location where you want to jump. Moving between chapters is easy, once you know how. thsi is great, but i have notice that a thumbnail can also be selected for each chapter marker. I am producing a training video and would like the thumbnail be a diffent “slide” is that possible. if i laid a track below my video track and applied the chapters there would my thumbnail be of the track below or the visible track? 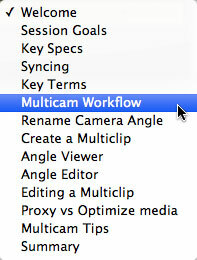 Final Cut Pro X supports the creation of “poster frames” attached to chapter markers. FCP 7 does not, and I don’t believe Compressor 4 does either. Thank you for a lot of anonymous help over the years. I am just finishing a 140-minute film in FCP 7, and I have exported it as a Quicktime movie once with chapter markers and once with DVDSP markers, but neither Compressor nor Quicktime 7 or 10 is able to read the markers—or display the markers. The markers are definitely purple chapter markers. What could I be doing wrong or is this a function of FCP7 not being able to cope with such a long movie? Many thanks for your time. 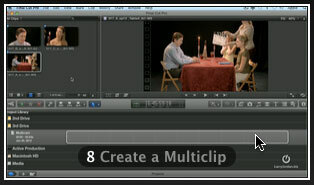 The only marker export that works reliably in FCP 7 is to select DVD Studio Pro Markers during export. If Compressor does not show the markers when you import the clip, that tends to indicate that the markers were not set to Chapter Markers in FCP 7. Although this talks about H.264 files, setting and exporting markers is identical for both DVD and H.264. Thank you so much for your quick reply Larry. The markers in FCP7 are chapter markers with descriptive names and with , etc in the comment box. 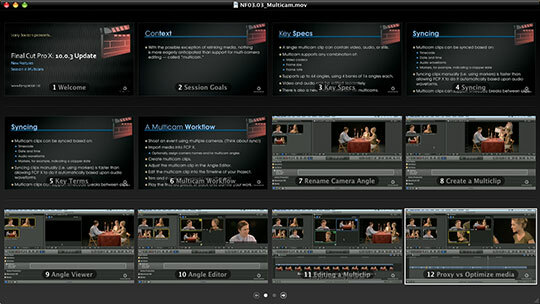 The markers are not available in compressor, Quicktime 7, Quicktime 10, or DVDSP either exported as HDV or as ProRes 422. Weird! The only way I can get them is by exporting a marker list from FCP, re-arranging that list so that each entry begins with timecode, and then importing it into DVDSP. Importing it into Compressor (for conversion to DVD files) does not survive the translation to DVDSP. SO, is there any harm (loss of precision) in importing the marker list directly into DVDSP? I am finishing a 140 minute film with many subtitles and other titles and plenty of colour correcting and sound corrected in Soundtrack Pro. This seems to have exceeded the capabilities of FCP 7 on an 8-core Mac Pro. Frequent crashes despite entire reformats, reload of OS, reload and update of FCP7, trashing preferences, copying contents of timeline into a new sequence, 700 gb free disk space etc. And this Chapter thing would appear to be a related anomaly. There is the lurking question as to whether Apple have made this kind of behaviour more likely with their Pro Apps Update—as opposed to the old update to 7.03—to force a switch. For me I’m stuck with FCP7 for better or for worse as I’m making films based on more than 400-hours of project footage which is all captured and logged in detail in FCP7. Anyway thank you so much for your time and attention! Is it possible to import quicktime (m4v) chapter markers into fcpx? Hi Larry, Some time ago when I edited in FCP7, It was scaring to change onto X, but since I’m beginning to getting to know X, I love it. So I bought FCP X 10.3.4 but I still have A LOT to learn. I found a pal here in the Netherlands whom is learning me a lot. Please go on teaching us this great program. See you on webinars. Enjoy learning the new software.